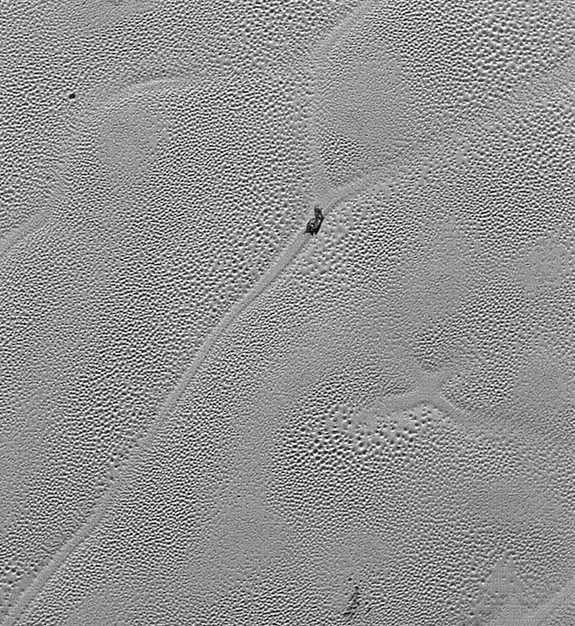 The Sputnik Planum X shows dark spot where the four cells concide. This dark patch is at its up left side which is like a dirty chunk of water ice floating over nitrogen ice. This image of X is one of the high-resolution photos that New Horizon captured with its telescopic camera from a distance of 10,000 miles or 16,000 kilometers on July 14, about 15 minutes before the probe's closest approach. NASA’s officials combined these images to form an area of about 50 miles wide and more than 400 miles long of Sputnik Planum. The spacecraft sent some of the information and images sometime after the closest flyby in July, most of the information was stored to expose later. And now the board has received about 25 percent of the total information. But many of the high-resolution images including the Sputnik Planum’s image have received now. The team estimated that the total data will come down to Earth by October or November this year. New Horizon sent these images on 24th of December 2015 to Earth and NASA exposed them on 7th January.